The keto personal pan pizza is my ultimate comfort food. The delicious combination of almond crust, pizza sauce, and warm cheesy toppings is deeply satisfying. In addition, it’s completely guilt free. Three cheers for keto pan pizza and its perfect personal size. No sharing allowed! One of the nice things I’ve discovered since starting the ketogenic diet is that my craving for food has greatly diminished. I am able to watch food commercials on TV quite passively now. Not a twinge of the old familiar cravings in site. With that being said, I still enjoy the familiar taste of foods that I grew up with. The good news is, I don’t need to sacrifice those delicious tastes just because I’m doing keto. I can still sit down and enjoy a keto personal pan pizza whenever I want to. The tasty keto personal pan pizza can be whipped up in a flash and personalized any way you’d like. As an added bonus, it tastes amazing. Mix and match with your favorite low carb toppings to make it personal. Be sure to watch the sugar content on the meats you find in the grocery store. They can be chock full of ingredients you don’t want to eat. My homemade low carb sausage might be a lower cost option when you are looking for the perfect topping. 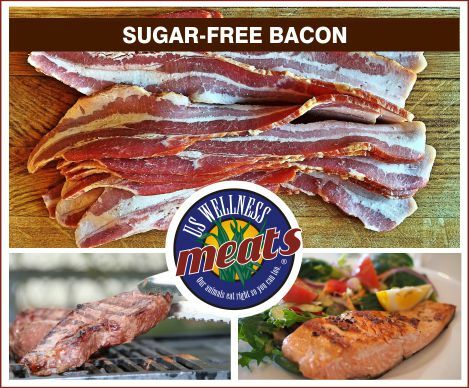 Or head over to US Wellness Meats for great sugar free options that I enjoy. I am constantly looking for the best online stores to buy quality ingredients with a price I can live with. A common problem on the keto diet is staying within a budget. So, I’ve put together a list of the best online friendly stores I’ve found. Check them out and tell me what you think in the comments below. Also, the Keto Forum is a great place to share your budget finds and see where others are finding their great deals. See below how the pizza all comes together or feel free to jump directly to the recipe. Gather your pizza toppings while crust is baking. Spoon pizza sauce onto pizza crust and spread to the edges of your pizza. Place the pre-cooked sausage on top of the pizza sauce. Arrange the fresh mozzarella cheese on top of the sausage. Sprinkle the Keto personal pan pizza with oregano, parmesan, and red pepper flakes. Return the pizza to the 350 degree oven and bake for an additional 15 minutes or until the toppings are bubbling. Enjoy a slice of guilt free pleasure. The keto pizza dough recipe was adapted very loosely from The KetoDietapp ‘s Keto Pumpkin Cheesecake Breakfast Pockets by Martina Slajerova. If you haven’t checked out her blog and keto diet app you are definitely missing out. It’s pretty darn amazing and a definite lifeline when I first started keto. Find a great thick and zesty keto pizza sauce recipe here. The Keto Personal Pan Pizza recipe makes 1 personal sized 5 inch pizza, 4 Slices. Place the dough ball on a cutting board or piece of parchment paper. It's best to keep the dough warm to make for easier rolling. If the dough loses its pliability, simply put it back in the microwave for a few seconds. Roll the dough out to your desired shape depending on what type of pan you'll be using. If you want a thicker crust, be careful not to roll the crust to thin. Once the dough is rolled out, Slide the pizza dough into your pizza pan. or onto a baking sheet. If using a pan, with your fingers push the dough until it covers the whole surface area and up the sides of the pan to hold your toppings. Prick the crust with a fork a few times to keep the crust from bubbling. Bake the pizza crust in the preheated oven for 10 minutes or util lightly browned. Remove crust from the oven. Allow pan to cool for a few minutes while gathering your toppings. Spoon the pizza sauce onto the pizza crust and spread the sauce to the edges of the crust. Arrange the fresh mozzarella cheese slices on top of the sausage. Sprinkle the Keto personal pan pizza with fresh chopped oregano and parmesan. Remove from the oven. Serve hot. I am definitely going to try this.Looks delish. Thanks Kimmy, I have this pizza about once a week. It is so quick and easy to make. I never get tired of it. Let me know how you like it.